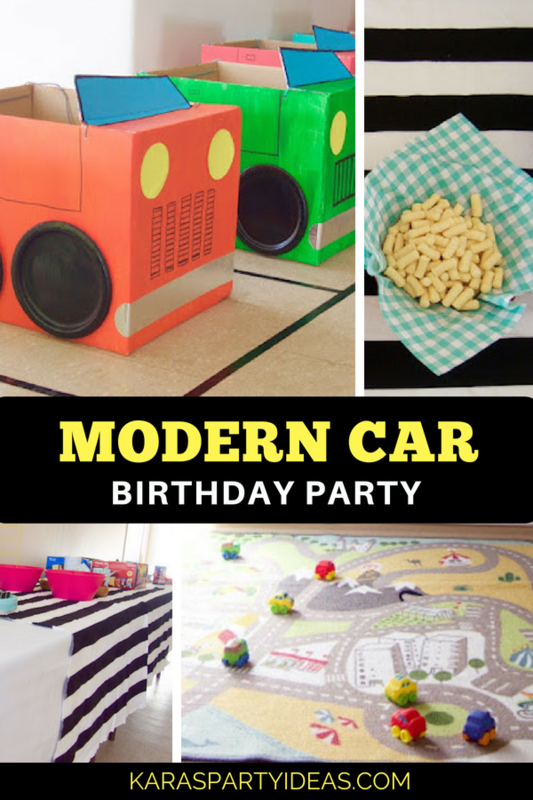 Climb on in and start your car, this Modern Car Birthday Party by Terianne Muhl of Five Jones Road, out of Ottawa, ON Canada, will take you far! 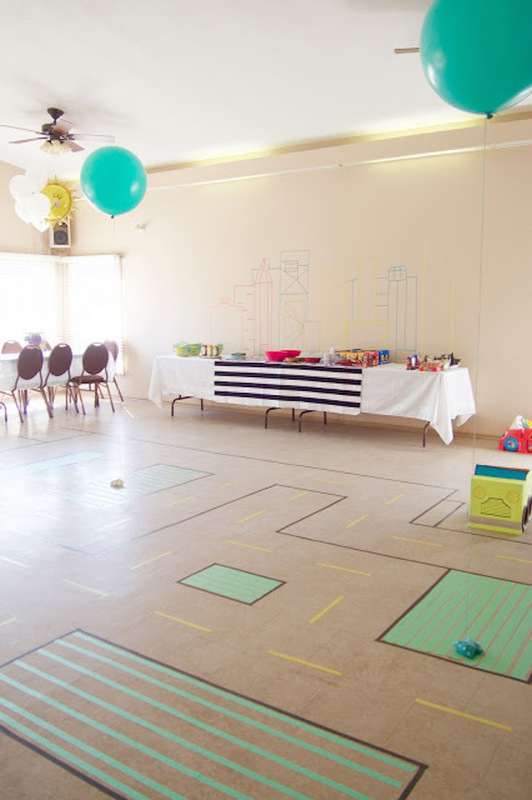 Revved up with details so cute, this party has, not only cars, but party ideas to boot! 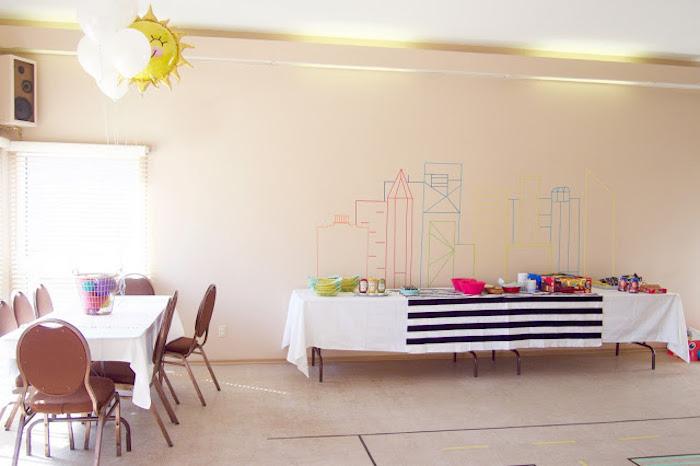 “I started no less than three pin boards with theme ideas for this party, and ix-nayed a plethora of great options. 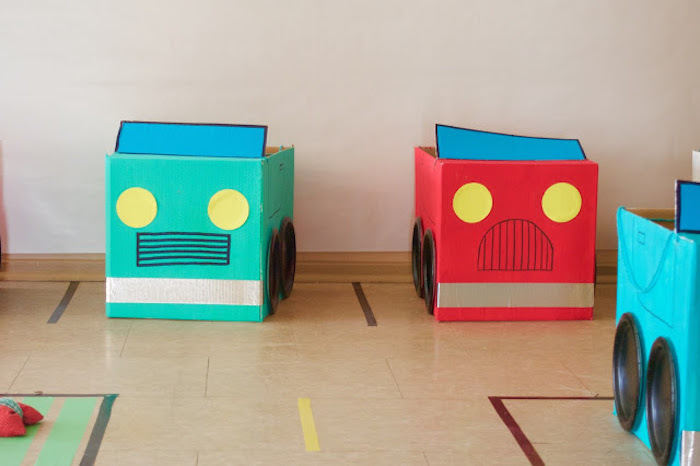 His favourites seemed to change week-to-week day-to-day; such is the life of an almost three year old, but the constant, and his legit one true love, has, and may always be, cars. He can play with them for hours and we always have one in tow, just in cases. #namethatmovie. Most car party inspiration seemed to be either vintage, Disney, or racetrack, which is totally cool, but not exactly what I was going for. I have, however, learned from parties past that the best inspiration comes from going out and seeing what is actually in stores. I love how it turned out. So bright and fun. 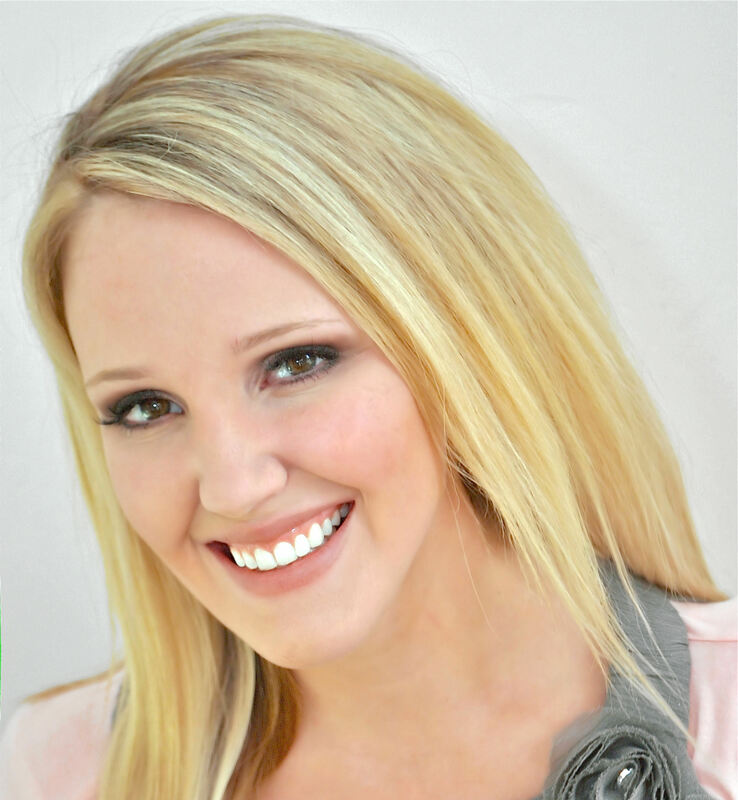 Perfect for the first day of Spring. Ryan added aluminum tape bumpers and Sharpied in the details. 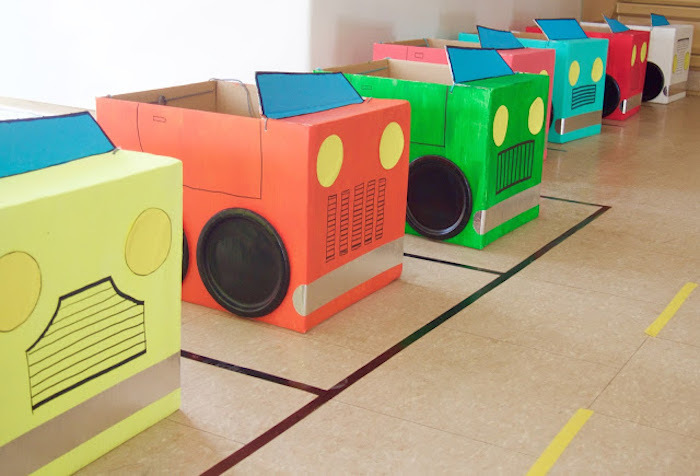 We cut out yellow and red circles for the head and tail lights, used paper plates for the wheels, and yarn for the straps. The most dramatic element, I suppose, was the city streets that I taped onto the floor using electrical tape. The tile on the floor made this a cinch. 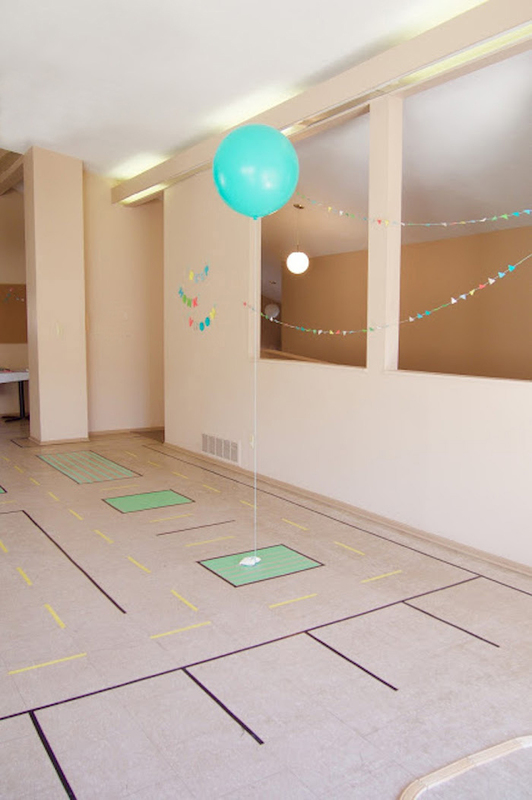 If you were to try and do this on a non-tiled floor, you may go insane. (You have been warned.) The “grass” and “ponds” are painters tape/coloured masking tape, which took a bit of effort to get off during clean up. It was a bit abstract for this age group, but it was still fun. I’m more than a little obsessed with these balloons. They were beyond expensive(wtf, helium), but totally worth it. 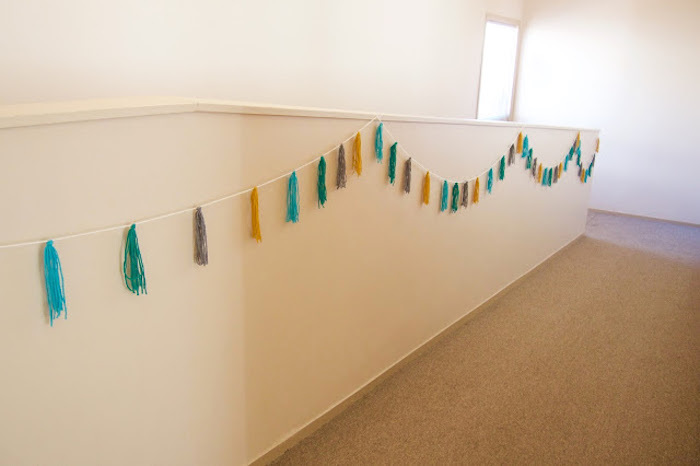 I changed out the ribbon they came with to twine and instead of spending another $5 on balloon weights I used rice bags that I made for Lilah’s first birthday. I’m not normally a huge fan of balloons, but I felt like this made them way cooler. 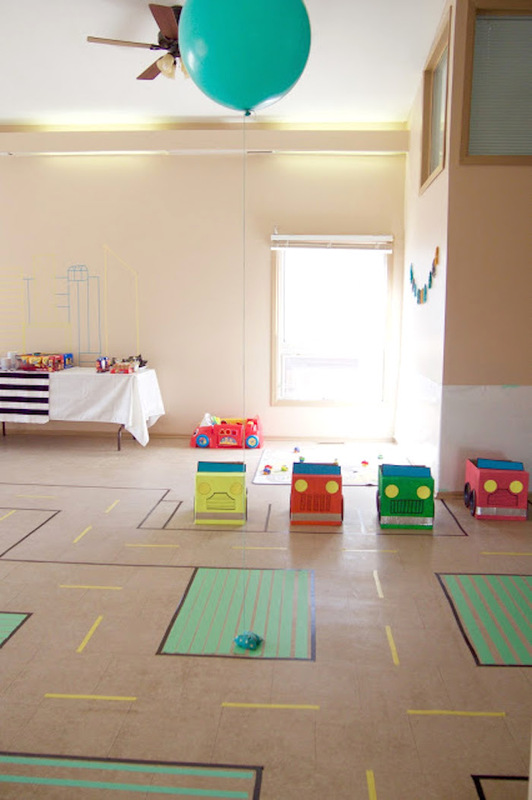 We set up two other play areas. 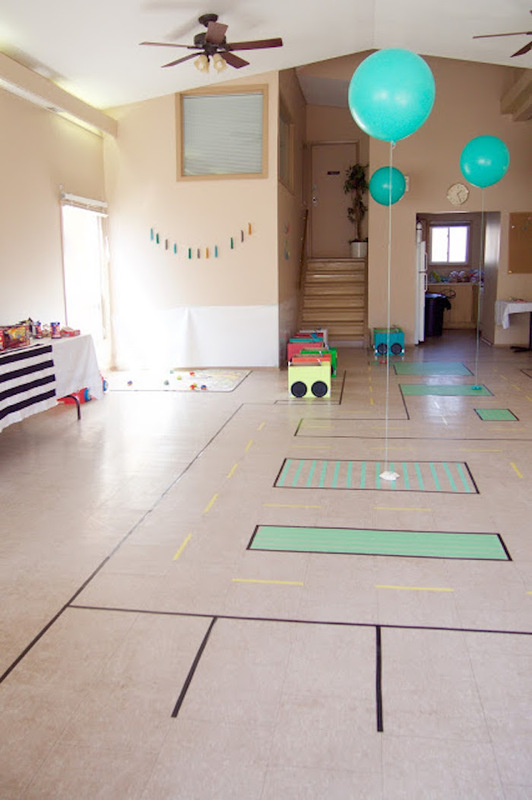 The baby zone, using a play rug, our crawl around car, and some chew friendly cars. And train tracks city streets…because we used cars instead of trains. 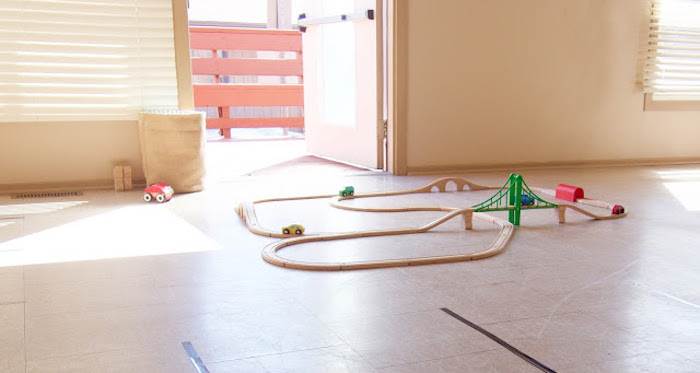 Of course, despite all this, the hit of the party was….drumroll please…the ramp. 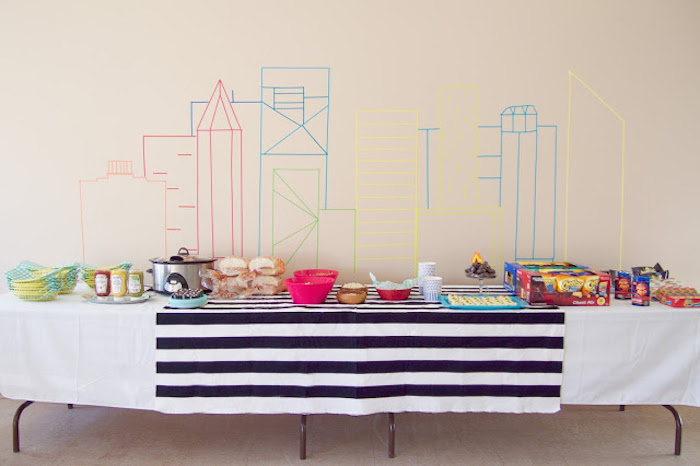 I used narrow Washi tape to “draw” a cityscape backdrop behind the snack table. This was met with mixed reviews. As I was taping it I thought it looked boring so I added in some geometric accents…I thought it looked cool. Maybe that one blue building in the middle makes no sense, but you can’t always control the creative mind. Ryan made futuristic flying car noises anytime we talked about it…It’s a tad futuristic. Whatever. 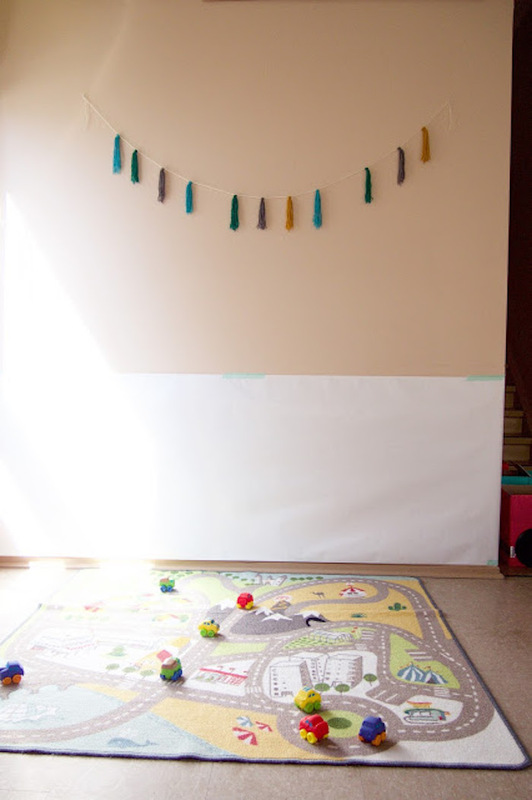 It’s colourful, fun, and took no time at all to put up/take down. Our snack table consisted of convenience store fare for our road trip. (get it? Hun? Hun?) Which was awesome because I’ve said it before, and I’m going to say it again, party food she ain’t my forte. 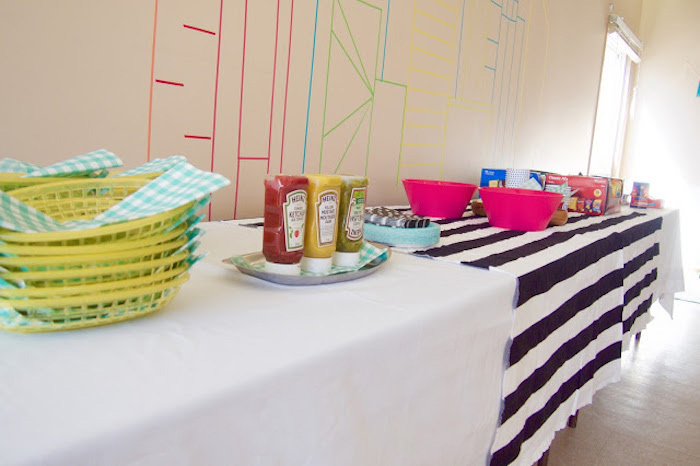 We served up: hot dogs, individually bagged chips, popcorn, goldfish and Ritz crackers, hot rods, mini donut flaming tire pile, rice krispie stop lights, chocolate pretzel dip sticks, chocolate dipped marshmallow air bags, and car topped cupcakes. 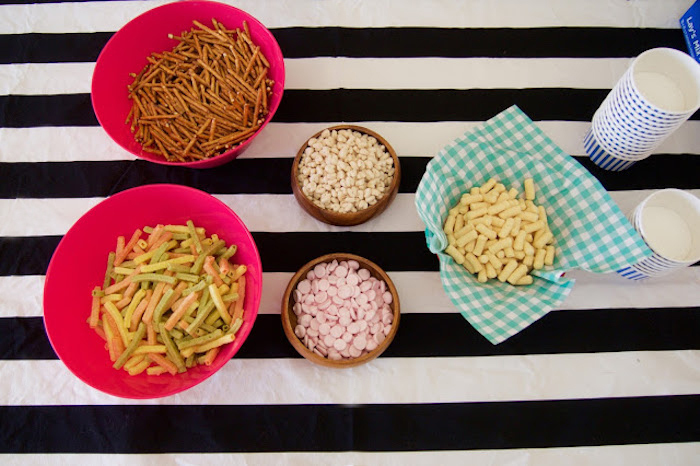 For the littles: veggie sticks, baby puffs, and yogurt drops. Vaughn thought it was the bees knees! 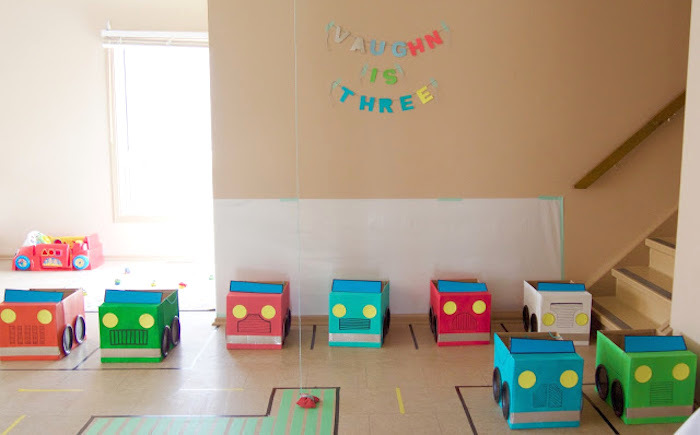 Zoom on over to see our best car birthday parties!